Player A, Player B and Player C ... a first, a second and a third choice. The voter was on the mark as Larsson was voted Canadian Baseball Network player of the year receiving the most first-place votes of any Canadian, as well as winning outfield spot as an on our 12th annual All-Canadian team playing south of the border. He received 39 of first-place votes from the 41 voters -- one more than shortstop Sean Jamieson (Simcoe, Ont.) of Canisius Golden Griffins. Larsson, drafted in the ninth round and signed by the Atlanta Braves, won two portions the triple crown of more than 702 Canadians playing south of the border. As mentioned Larsson led with 29 homers and 84 RBIs. His .432 average was second highest, tied with Jefferson’s Tyler Hibbert, behind leader Mitch Daniels of Texas A & M International Dust Devils. Larsson’s 29 homers were nine more than Jeff Hutton (Ladner, BC) of Tabor who hit 20 and his RBIs were six more than Hutton’s total. He won the Tino Martinez DII Player of the Year award. Larsson had one of the most dominant performances in Division II history, being named to the inaugural College Baseball Lineup D-II all star team, leading D2 in home runs (29), RBIs (84), slugging percentage (1.000) and total bases (190). His .432 average was 11th overall. The inaugural College Baseball Lineup DII All Star team consists of thirty-six top student-athletes from across the nation. The roster consists of at least one player from each conference, creating an über-awesome club that could go nine innings with any amateur club in the nation. _ 1B Karl Amonite (Woodslee, Ont. ), of the Auburn Tigers, in 2005. _ OF Charlie MacFarlane (Lantzville, BC), of the Cumberland Bulldogs, in 2004. 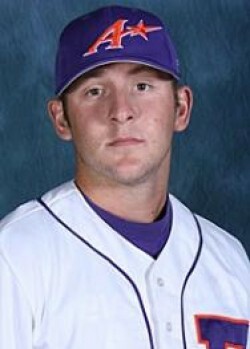 _ C Aaron McRae (Delta, BC), of the LSU-Shreveport Pilots, in 2003. _ OF Ryan Kenning (North Vancouver, BC), of the New Mexico State Aggies and RP-SS Jesse Crain (Toronto, Ont. ), of the Houston Cougars, who shared top honours in 2002. _ LHP Jeff Francis (North Delta, BC), of the British Columbia Thunderbirds, in 2001. In addition to Lone Star Player of the Year, Larsson was also been named the South Central Region Player of the Year by Daktronics, the American Coaches Association and the National Collegiate Writers Association. This season Larsson tied a school record with eight RBIs in a single game, matching a school and conference record when he belted three home runs in a single contest. His most dominant power surge came during a stretch in March, when Larsson established a new NCAA Division II record by homering in nine consecutive games. Paul Snieder (Ottawa, Ont.) pulled off a rare double going back to the days of when Crain, as a Houston Cougar won First Team honours as a reliever and second team honours as a shortstop. Sneider took two spots winning third-team honours both as a first baseman and as a reliever. Our 41-person voting panel consisted of 14 elite and college coaches plus 10 scouts from both sides of the border, including three scouting directors, nine of our writing staff, five executives, an agent, a broadcaster and a writer. Left-hander: Sheldon McDonald (Spruce Grove, Alta.) University of British Columbia Thunderbirds. McDonald, who came to UBC for his final two years of eligibility, ranked first on the T-Birds with 1.46 ERA compiled over 11 appearances and 55 2/3 innings. He struck out 55 batters while walking only 13 en route to a 7-2 record. The power-throwing left-hander would have likely gone earlier in the draft had a mid-season injury not slowed him down. McDonald was taken in 33rd round by the Chicago Cubs. UBC has now seen 15 players taken in the MLB Draft since the program was resurrected in 1997. McDonald pitched for coaach Terry McKaig, who also had the likes of future pros Jeff Francis, Brooks McNivem, Mark Hardy and Brandon Kaye. On the way up he pitched for the Spruce Grove White Sox and coach Steve Sullivan, earning Canadian Baseball Network Second Team honours in 2010 and First Team honours as a reliever in 2008. Right-hander: Ryan Thompson (Calgary, Alta.) Franklin Pierce Ravens. A consensus All-America First Team selection in 2011, Thompson put up numbers among the nation’s best in his first year for the Ravens after transferring from the University of Connecticut. His 1.23 earned-run average was good for fifth in the country, while his 11-1 record tied him for eighth in the nation in wins. In addition, Thompson ranked eight in strikeouts (114), 18th in hits allowed per nine innings (5.97) and 23rd in both walks allowed per nine innings (1.23) and strikeouts per nine innings (10.8). In addition, to East Region Pitcher of the Year and All-America First Team accolades, Thompson was a consensus All-East Region First Team selection, as he earned honors from the NCBWA, the ABCA and Daktronics. Before that, he was pegged as Northeast-10 Conference Pitcher of the Year and was an All-Northeast-10 First Team selection. Thompson was a finalist for College Baseball Lineup’s Tino Martinez Division II Player of the Year Award and was selected to the inaugural CBL DII All-Star Team. Furthermore, he was an NEIBA All-Star Team selection. Thompson was selected by the New York Yankees in the 36th round draft but decided to return for his junior campaign. He was instructed by former minor leaguer Reggie Rivard in Fort McMurray, Alta. 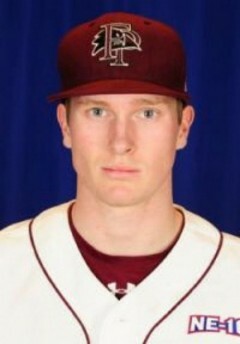 Reliever: Billy Hurley (Mississauga, Ont.) Wayne State Warriors. Hurley allowed one earned run during the regular season (0.32 ERA), finishing the season with a 1.30 ERA for the Warriors -- lowest since Bruce Finlayson’s record of 1.15 in 1969. He was 4-0 record with eight saves and 31 strikeouts. For his first save he worked a season-high four innings and totaled four strikeouts to pick up his first save against St. Joseph’s and fanned four in a three-inning appearance at Hillsdale, taking the victory. He earned saves in both games of a doubleheader against Hillsdale and another at Ashland. Hurley was the winner in the Great Lakes tournament opener against Ashland, pitching 3 1/3 innings and striking out three in a 12-inning, 7-6 win. He earned his eighth save with a scoreless inning against Southern Indiana in the NCAA Midwest Regional. Hurley made 19 relief appearances, tied for third-most in school history, his save record was the most since Jon Venuto’s school-record 10 saves in 2000. Hurley was also a semi finalist for the Tino Martinez Award, which recognizes the top player in Division II, as well as earning Daktronics, Inc., as well as earning All-Midwest Region honors in a vote by the region’s sports information directors and all Great Lakes Second Team honours. Plus he shared WSU’s Most Improved Player honors with Josh Wedesky and earned All-Academic honours. Hurley pitched for Team Ontario and coach Murray Marshall after a successful career under coach Remo Cardinale with the Mississauga North Tigers. Catcher: Trevor Edwards (Toronto, Ont.) UNC-Greensboro Spartans. Edwards led the Spartans at the plate with a .320 average and a team-high eight home runs. He knocked in a team-best 51 runs this year and was tied for second in the Southern Conference with 18 doubles. He also had eight homers. On the Canadian pecking order Edwards tied with Ryan Fleming (Whitby, Ont.) of Georgia State with 51 RBIs each. Chase Larsson (Vancouver, BC) of the Cameron led all Canucks with 84 RBIs, followed by Jeff Hutton (Ladner, BC) of Tabor who had 78. Next were Jon Cotter (Moose Jaw, Sask.) who had 59 for Colby and Scott Jones (Victoria, BC) with 56 for Colby. Edwards earned first Southern Conference honors as voted by coaches and All-SoCon second-team honours by the media. He played for the Toronto Mets and coach Jason Chee-Aloy. 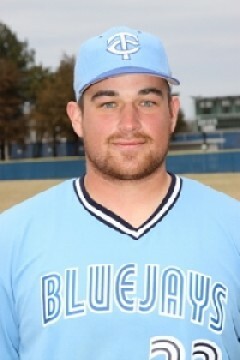 First base: Jeff Hutton (Ladner, BC) Tabor Bluejays. Hutton batted .378 with 70 hits, including seven doubles and 20 homers, to go with 78 RBIs and 59 runs scored. He also set new Tabor records in home runs and RBIs, ranking first in the Kansas Collegiate Athletic Conference and second and third in the nation respectively in both categories. Hutton led the KCAC in slugging percentage at .741 ranking him 19th in the nation. He was also tops among KCAC players in total bases with 137 and was second and third in the conference in runs scored and hits. Hutton won NAIA second team honours, KCAC All-Conference First Team honours. A Newman University transfer after earning First Team All-Heartland Conference and First Team All-Walter Johnson league honors as a DH in 2009 and as a first baseman in 2010. Amongst Canadians, Hutton was second in homers to Chase Larsson (Vancouver, BC) of the Cameron Aggies who in homers, who hit 29 and had 84 RBIs. Like Justin Morneau and Jeff Francis, Hutton played for the North Delta Blue Jays, where Ari Mellios and Mike Kelly ran the show for years. Hutton earned Canadian Baseball Network Third Team honours in 2009. Second base: Maxx Tissenbaum (Toronto, Ont.) Stony Brook Seawolves. Tissenbaum started all 54 games at second base leading the America East with 55 runs scored, while ranking second in the conference in RBI (43) with on-base percentage (.433). He was third in doubles (20) and fourth in average (.343) and hits (68). He was 19th toughest player in the nation to strikeout (one per 18 AB), ranking in the top 100 in the country in runs and doubles. He went 3-for-4 in series finale against No. 17 North Carolina and had three hits and three RBI against New Jersey Tech, while knocking in career-high five runs against New York Tech. He earned All-America East first team selection, ABCA All-Northeast Region second team selection and America East player of the week honours. Tissenbaum also was named Louisville Slugger pre-season third team All-American by Collegiate Baseball Newspaper. Tissenbaum played for the Toronto Mets and coach Jason Chee-Aloy. Third base: Joel Lutz (Medicine Hat, Alta.) Muscataine Cardinals. Lutz ended the season on a high note with a sixth-inning, grand slam in the regular season, a 14-8 Cardinals win over Southeastern Community College. He batted .368 with 12 doubles, 11 homers and 48 RBIs. He had 11 homers on the season to rank behind leader Chase Larsson (Vancouver, BC) of the Cameron Aggies with 29, as well as Jeff Hutton (Ladner, BC), Tabor, 20, Sean Jamieson (Simcoe, Ont.) Canisius and Ryan Fleming (Whitby, Ont.) Georgia State 13 apiece and Jesse Sawyer (Calgary, Alta.) South Daktota State 12. He earned Division 2 DI Second Team All-Region honours. Lutz played for the Medicine Hat Monarchs and coach Lovell McDonnel. Shortstop: Sean Jamieson (Simcoe, Ont.) of Canisius Golden Griffins. Jamieson broke his own program record with nine RBIs in a game on March 22 and became the first Golden Griffin in 15 years to hit for the cycle. Playing his second season for coach Mike McRae (Niagara Falls, Ont.) he led the Griffs in average, hits, runs scored, home runs, slugging percentage, stolen bases and on-base percentage. He shared the Player of the Year award with Dan Paolini from Siena. He hit .350, owned a slugging percentage of .635, led in runs scored (60), second in homers (13) and steals (22), fourth in hits (69) and third in RBI (51). Jamieson earned Metro Atlantic Athletic Conference Baseball Co-Player of the Year -- the third player in program history to win the MAAC Player of the Year award, joining Rick Foit (1994) and Kevin Mahoney (2009) -- was named a Capital One Academic All-American and earned All-MAAC First-Team honors for the second consecutive season. A two-time MAAC Player of the Week, Jamieson also earned Louisville Slugger National Player of the Week honors. He was tied for third were Ryan Fleming (Whitby, Ont.) of Georgia State with 13 apiece, Chase Larsson (Vancouver, BC) of the Cameron Aggies who hit 29, followed by Jeff Hutton (Ladner, BC) of Tabor who hit 20. Jamieson, who played for coach Jeff Amos of the Brantford Braves and now of the Badlands Academy, as well as Mel Oswald’s Canadian Thunder Birds, earned Canadian Baseball Network Second Team honours in 2010 and Honourable Mention in 2009. Larsson had the most first-place votes and was the highest Canadian college player drafted ... going to the Atlanta Braves in the ninth round. His .432 average tied for second with Tyler Hibbert (Unionville Ont.) of Jefferson, behind only Mick Daniels (Southwold, Ont.) of Texas A@M International, who batted .446. One day after being named the Tino Martinez D2 Player of the Year, Larsson was selected by the Braves. He led D-II in home runs, RBI, slugging percentage (1.000) and total bases (190), finishing 11th overall in batting average (.432). He played for North Delta Blue Jays, coached Ari Mellios and Mike Kelly. Bourgeois posted a .358 average with 10 doubles, two triples, seven home runs and 38 RBIs for the Golden Eagles. He also captured one Conference-USA hitter of the week award this season. He had three hits on senior day vs. Rice, drove in game-tying two runs against Alabama-Birmingham, hitting safely in 26 of his final 33 games and had a season-high five hits at Central Florida. He also had a 3.82 grade point average in Construction Engineering. He was chosen to the Capital One Academic All-America First Team, selected by the College Sports Information Directors of America (CoSIDA). Bourgeois is the 10th Southern Miss baseball student-athlete to be honored with this award. As well, Bourgeois was named to the Conference USA baseball All-Academic team by the league office and was named First-Team Academic All-American. Bourgeois, who played for Ailes du Quebec and ABC and coach Joel Landry, earned third team Canadian Baseball Network honours in 2009. Hibbert batted .428 with 11 doubles, 11 triples, 56 runs scored, 25 RBIs, 36 stolen bases and had an on base percentage of .507 while hitting lead-off all year for the Vikings. The centerfielder is the second All-American in as many years for the Vikings, following pitcher Matt Stites’ Third Team All-American selection last year, and is the first 1st-Team All-American for Jefferson College since pitcher Cliff Politte earned the honor in 1995. Hibbert was named the Region XVI Player-of-the-Year, the South Central District winner of the annual Rawlings Big Stick Award -- given annually to the top hitter in each of the ten NJCAA Division I Districts and First Team All-American today by the NJCAA. He tied with Cameron’s Chase Larsson (Vancouver, BC) each batting .432, second to Mick Daniels (Southwold, Ont.) of Texas A@M International for the highest batting average amongst Canadians. Hibbert played for coach Danny Bleiwas and the Ontario Blue Jays. DH: Mark Jeffery (Whitby, Ont.) Tarleton State Texans. One of Jeffery’s better games came against Northwood as he hit a two-run homer to left in the bottom of the first inning, reached on an error and stole second in the second, singled to left in the third, hit a two-run homer to left in the fifth and hit an RBI-single to left in the sixth. So, he finished the day going 4-for-5 with five RBIs in a 17-7 win over. Jeffery earned second team honours in the Lone Star Conference. He played for Team Ontario and coach Murray Marshall. Left-hander: Shaun Slemko (Courtice, Ont.) Genesee Cougars. 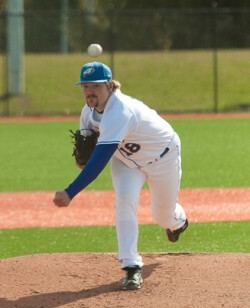 Slemko pitched a seven inning complete-game effort in a 4-2 win over Finger Lakes, walking none while striking out five. He was the Stud Hoss for the third-ranked Cougars going 5-3 with a 1.07 ERA. Slemko walked five and struck out 26 in 50 1/3 innings in eight starts. Slemko was a member of Rich and Rob Butler’s Ontario Prospects. Right-hander: Robert Nixon (Welland, Ont.) 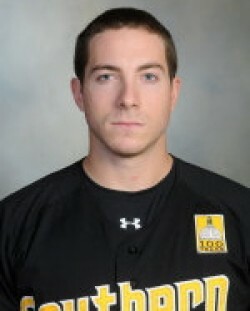 Adelphi Panthers. Nixon defined the word ace for the Panthers, appearing in 15 games making 14 starts with team-best 11-2 record to finish fourth on the team with a 1.43 ERA. He led with 10 complete games (a single season record), recording one save and one complete game shutout, while leading the team with 113 1/3 innings pitched, striking out 104 (both single season records). Nixon tossed a no-hitter against Merrimack and struck out a season-high 11 batters two times. He holds the program record for strikeouts (256) and wins (28). Nixon was named Second-Team All-American by Rawlings/ABCA and was named to the NCAA East Regional All-Tournament team, received All-NE-10 First-Team honors and twice was two-time NE-10 Pitcher of the Week. Reliever: David Walkling (Nanaimo, BC), Penn State Nittany Lions. Walkling had the best start in Penn State history before being felled by injury. He was 5-0 with a 1.71 ERA in his first six outings with the Nittany Lions and was injured so early that school officials hoped he could gain medical redshirt status. He opened with a victory in each of his first three appearances, working 1 1/3 innings of scoreless relief against West Virginia in his debut, fanned five and allowed two hits in 4 1/3 innings against Eastern Kentucky, beat NC State after striking out one in 1 2/3 innings, started against Old Dominion putting up three zeros innings with five strikeouts, then worked six innings against Norfolk State striking out 11. After pitching 4 2/3 innings against Wichita State he underwent Tommy John surgery. Walkling pitched for the Nanaimo Pirates and coach Scott Wallis. Catcher: Mac Harrison (St. Thomas, Ont.) Chipola Indians. Harrison singled in a run as Chipola scored six runs in the final three innings to beat Northwest Florida State 6-5 in the final series of the year before going on the Florida state tournament championship at Joker Marchant Stadium in Lakeland, where the Indians won for the third time in five years. Harrison appeared in 37 games, making 29 starts hitting .379. He had nine doubles, three homers and 25 RBIs with a .975 OPS. He played for Mike Lumley’s London Badgers program. First base Brett Sanders (Paris, Ont.) Southeastern Blackhawks. Sanders was 2-for-3 with a double and three RBIs as Southeastern beat Kirkwood 11-1 in the Region XI semi final tournament at Riverfront Stadium in Waterloo, Iowa. Sanders hit seven home runs tied for fourth amongst first baseman, behind Hutton, who hit 20, Jordan Castaldo (Toronto, Ont.) Arkansas State and D.J. Boschman (Abbotsford, BC) of Grayson County who each hit eight. Sanders was tied with Greg Appleton (Port Coquitlam, BC) of Cumberland. Sanders hit .395 with 46 RBIs and earned Division II First Team All-Region honours. Second base: Jonathan Slattery (Mississauga, Ont.) William & Mary Tribe. Slattery led the Tribe with 40 RBIs, 15 doubles and 35 runs scored. He finished third on the team with a .296 average and third with four home runs, totaling 18 multi-hit games, including two four-hit games. He was 4-for-4 with two walks, a double, a RBI, and three runs scored against Liberty and hit the game-winning home run at Richmond in the 10th inning to lift the Tribe. Slattery earned All-Colonial Athletic Association Third team honours. He played for Team Toronto and Jason Chee-Aloy, earning Canadian Baseball Network earning third team honours in 2009. Third base: Carter Bell (Courtenay, BC) Oregon State Beavers. When No. 9th ranked Orgeon State faced its toughest test of the schedule -- No. 5 Arizona State, No. 18 Arizona, UC Santa Barbara, Portland and Seattle -- Bell went 16-for-39, good enough for a .410 average. Bell batted .299, fourth on the team in hitting, with 22 RBIs before being selected in the 29th round by the Arizona Diamondbacks. He played in 52 games and started 48. Bell played for coach Dave Wallace and the Parksville Royals. Shortstop: Pier-Olivier Dostaler (Mont Carmel, Que.) Lamar Runnin’ Lopes. Dostaler went 5-for-6 with a double, triple and three RBIs in a 16-14 win over Western Nebraska, he had three hits, including a homer in a 2-0 win against Northeastern, was 4-for-5 with a double, homer and three RBIs in an 18-8 win against Colorado State and had three hits in a 16-1 win over Seward County. Dostaler earned First Team All-Region honours. He played for the Eagles Plante Sports Three Rivers and coach Rémi Doucet. Outfielders: Kevin Calbick (Burnaby, BC) Trinity Tigers; Greg Wallace (Nanaimo, BC) Evansville Purple Aces and Ryan Fleming (Whitby, Ont.) Georgia State Panthers. Calbick missed 10 games because of an injury, but still led the Tigers in batting (.407). He had 11 doubles, three triples, five home runs, 28 RBIs and scored 41 runs. He was an All-SCAC First Team honoree and earned Baseball Coaches Association West Region Team honours and made the Southern Collegiate Conference All-Tournament Team as Trinity beat Hendrick 9-1 in the final. Calbick’s average was topped only by Mick Daniels (Southwold, Ont.) of Texas A@M International, .446. Hibbert and Larsson each at .432, followed by Chayse Marion (Red Deer, Alta.,) Trinidad State and Calbick at .407. Calbick played for Bill Green’s Coquitlam Reds. Wallace tripled in his final game for Evansville, a 4-3, 11-inning loss to Illinois State in the Missouri Valley Conference tournament. He had a .314 average and ranked second with 45 runs scored and 36 RBIs. He had 16 doubles, five triples and seven homers. He was named a All-Missouri Valley Conference honourable mention. Wallace had a memorable career at Evansville earning: 2010 Second Team ABCA All-Midwest Region Selection, First Team All-MVC, MVC All-Tournament Team Selection, MVC Player Of The Week three times , Vectren UE Student-Athlete Of The Week twice; 2009 Pre-season Brooks Wallace Award Watch List (National Player of the Year) and 2008 Louisville Slugger Freshman All-America by Collegiate Baseball. Wallace, who played for the Nanaimo Pirates under coaches Larson Bauck and Brad Weinmeyer, earned Canadian Baseball Network First Team honours in 2010 and Honourable Mention in 2008. Fleming delivered back-to-back game winning RBIs in back-to-back, one-run wins against Towsam. In two seasons as a Panther, Fleming established himself as one of the top power hitters in the Colonial Athletic Association. His 26 career home runs rank eighth in school history. Fleming led the Panthers with 13 homers and 51 RBIs. He earned second-team all-CAA honors in 2010, when he also led the Panthers with 13 homers, along with 59 RBI and 59 runs scored. Fleming tied for third amongst Canadians in homers with Sean Jamieson (Simcoe, Ont.) of Canisius with 13 each, behind Larsson and his 29 plus Hutton (Ladner, BC) of Tabor with 20. In the RBI department, Fleming was tied for fifth with Trevor Edwards (Toronto, Ont.) with UNC-Greensboro with 51 apiece, behind Larsson, 84 RBIs, Hutton , 78, Jon Cotter (Moose Jaw, Sask. ), 59 Colby, Scott Jones (Victoria, BC), 56, Colby. Fleming, who played for coach Danny Bleiwas and the Ontario Blue Jays, earned Canadian Baseball Network Second Team honours in 2010. 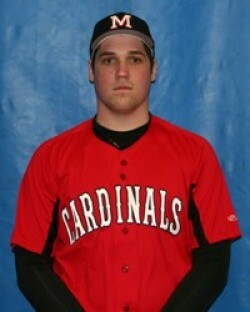 DH: Brian Simone (Amherstburg, Ont.) West Alabama Tigers. Simone was fifth in the Gulf South Conference with 18 doubles and led the team in average (.359), doubles (18), RBIs (40), slugging percentage (.545) and walks (18). He also hit .446 (25-for-56) with runners in scoring position. He earned Daktronics All-South Region Team following a successful senior campaign. A three-time All-Gulf South conference selection, he garnered first-team all-GSC honors for the second consecutive season in 2011. He leaves Livingston sixth all-time in the UWA books with 40 doubles. For his career, the 2009 NCAA Division II South Region Tournament team member amassed 161 hits, 111 runs and 109 RBIs while drawing 70 walks. Simone played for coach Richard Solomon and the Windsor Selects. Left-hander: Shane Davis (Belmont, Ont.) Canisius Golden Griffins. In the final start of his successful career, Davis had a no-decision working 7 1/3 innings as Canisius lost 3-2 to the Manhattan Jaspers in the opener of the Metro Atlantic Conference tourney. Davis allowed two runs on six hits, walked two and struck out four. Davis was conference Pitcher of the Week pitching eight innings, allowing one run on five hits, walking zero and fanning four to give Canisius an important game one win in the final regular-season series. Davis allowed one run for the fourth time in the last six starts. Davis earned his 35th career win in his 55th career start, tying the program record for career starts. The redshirt senior threw 97 pitches, 16 in one at-bat. He had two or fewer walks for the 25th time in 27 starts and went at least six innings for the 22nd time in 27 starts. 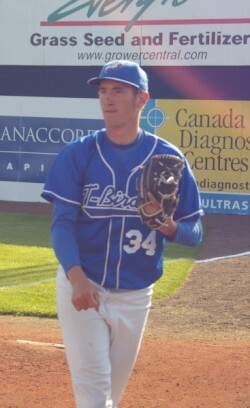 Davis pitched for St. Thomas Tomcats and coach Rob de la Penotiere and earned first Canadian Baseball Network honours in 2008, then honourable mention in 2009-10. Right-hander (tie): Jeff Gibbs (East York, Ont.) Maine Black Bears and Eric Brown (Thunder Bay, Ont.) UBC Thunderbirds. Gibbs may have pitched THE game of the year, considering what was on the line. Gibbs allowed two hits over eight innings as Maine beat Florida International University 4-1 in the Chapel Hill Regional off the NCAA baseball tournament. The win was the first in the NCAA Regionals for the Black Bears since defeating Southern Miss. 12-2 in 2005. In addition, it was the 1,800th win in program history. Gibbs allowed a pair of hit, struck out eight batters in the game and improved to 8-5 on the season. He pitched for Murray Marshall and Team Ontario when he was drafted in 2009 in the 48th room by the Jays as well as East York’s Mark Ireland and earned Canadian Baseball Network Second Team honours in 2010. Brown put together a stellar final campaign in the Blue and Gold, with a 2.72 ERA and 7-2 record to lead a very strong UBC starting rotation. In 83 1/3 innings of work, he’s struck out 75 batters while only walking 19 and his opponent batting average was .227. He earned NAIA West with nominations being named to the All-Region and Gold Glove teams. Brown pitched for Jason Hart and the Northwest Slam. Reliever: Paul Snieder (Ottawa, Ont. ), Northwestern Wildcats. Snieder was born in Ottawa moved to Moose Jaw when he was one when his father was in Canadian Forces at age five the family moved to Hawaii. He is a Canadian Citizen with a passport, and holds both a Canadian and US passport. He pitched in 21 games, posting team bests of five saves and a 2.88 ERA. He worked the final three innings, recording four strikeouts to pick up a save against North Carolina State, picked up the win against Dartmouth and picked up a save and collected two hits in a win at Minnesota and pitched three scoreless innings of relief to earn a win over Illinois. He was named to the semi final list for the John Olerud Two-Way Player of the Year award. 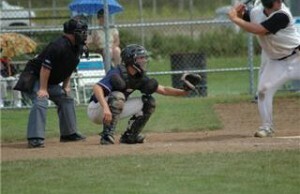 Catcher: Mike Reeves (Peterborough, Ont.) Florida Gulf Coast Eagles. Reeves drove in a career-high six runs, highlighted by a grand slam, to lead FGCU to a 10-7 win over Belmont, Vince Gill’s favorite school. Reeves’ career day saw the second-year catcher go 3-for-4 with a triple and his second homer of the season en route to the second-highest RBI total in the program’s Division I history. Trailing 2-1 in the top of the third, FGCU took the lead when Reeves sent a 1-1 pitch over the right field wall to give the visitors a 5-2 advantage. Reeves gave the Eagles more breathing room in the fifth with a two-run triple. Reeves hit .314 in 52 games -- making 48 starts -- as he added nine doubles, two triples, two homers and 39 RBIs. He played for coach Danny Bleiwas and the Ontario Blue Jays. First base: Paul Sneider (Ottawa, Ont. ), Northwestern Eagles. He went 3-for-5 with a homer, two runs scored and three RBIs in a victory at Indiana and was n amed Big Ten Player of the Week, batting .588 in four Wildcat victories, including going 6-for-8 with a grand slam in a two-game series sweep of Michigan. Sneider homered, doubled and drove in two in a victory over Purdue, he collected two hits and two RBIs in a win over Illinois, collected three hits in the home-opener vs. Valparaiso and in the last two games of the series at Ohio State went a combined 5-for-7 with a home run, seven RBIs. He appearing in 48 games, starting 47, he batted .347 with 13 doubles, six homers and 42 RBIs to earn all-big Ten honours. Second base: Trentt Copeland (Guelph, Ont.) Evansville Purple Aces. Copeland hit .365 in Missouri Valley Conference games and .308 on the season, leading the Aces with a .453 on-base percentage in Valley games, recording 18 multi-hit games and 17 doubles and reached base in every MVC game on the schedule. Copeland had a hand in 36 double plays, leading UE to a 17th national rank in double plays per game (1.09) and recorded a Valley-high nine assists against Michigan State. Copeland earned All-Missouri Valley Conference Second Team honours and owns a 3,69 cumulative GPA in management. He played for coach Danny Bleiwas and the Ontario Blue Jays as well as Scott Van de Valk and the Guelph Silver Creeks. 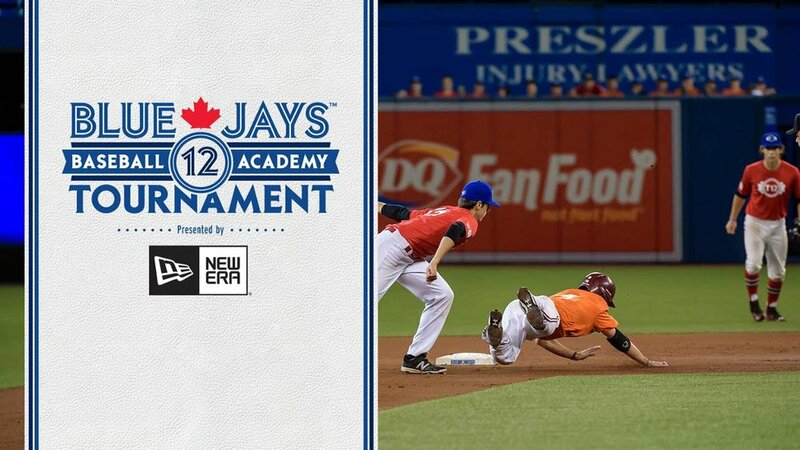 Third base (tie): Drew Pettit (Fonthill, Ont.) Canisius Golden Griffins and Jesse Sawyer (Calgary, Alta.) South Dakota State Jackrabbits. Pettit went 9-for-11 in three-game series at Siena, including four hits in each game of doubleheader and had a game-winning single in 10th inning of 7-6 win over Toledo on Feb. 20. He had two nine-nine game hitting streaks and had 17 multi-hit games in final 43 games, while hitting .425 with runners in scoring position. He led the MAAC with a .423 batting average in conference play and on the season ranked second on the team with a .345 average. He led the team and ranked third in the MAAC with 70 hits -- ninth in program history. Pettit was named to the Capital One Academic-All America First-Team, one of 11 Division I players to receive the award. He played for the Niagara Rebels and coach Alan Montgomery before heading south. Sawyer led the team in home runs for the third consecutive year, clubbing 12 homers, seven in league play, to up his Jackrabbit-best career total to 50. He also hit .330 during the conference play and drove in 27 runs. He was the recipient of the Greg Geary Big Stick award and earned All-Summit League Team second team honours, after earning first-team recognition at third base in both 2009 and 2010. He had 12 homers to rank fourth amongst Canadians behind Larsson's 29, Jeff Hutton's 20, plus Sean Jamieson (Simcoe, Ont.) Canisius and Ryan Fleming (Whitby, Ont.) Georgia State had 13 apiece. Sawyer played at the Prairie Baseball Academy and coach Blair Kubicek and was the Canadian Baseball Network player of the year earning first team honours in 2009 and 2010. Shortstop: Jon Cotter (Moose Jaw, Sask.) Colby Trojans. Cotter doubled in a pair of runs in a 6-0 win over Highland, tripled in three runs in an 11-5 win over Pratt and doubled singled and drove in a run in a 4-2 win over Dodge City. He hit .341 with 19 doubles, three triples, three homers and 59 RBIs, while stealing 22 bases. Cotter earned second team all Jayhawk west honours. He was third in RBIs amongst Canadians behind Larsson with 84 RBIs and Hutton's 78. In his final year before heading south was with the Moose Jaw Cardinals under coaches Roger Anholt and Charlie Meacher. He earned Canadian Baseball Network Third Team honours in 2010. Outfielders: Jon Mihic (Langley, BC) Kansas Wesleyan Coyotes, Austin Russell (Victoria, BC) Colby and Curtis Beaudoin, (Lethbridge, Alta.) LSU-Shreveport Pilots. Mihic doubled, singled and knocked in a run to win the Kansas conference tourney with an 8-7 win over the Tabor Blue Jays for the Coyotes third straight KCAC Tournament Championship. Mihic hit .394 with 12 doubles, six homers and 39 RBIs in 48 gaames. He was named First Team All-KCAC. Mihic played in the BC Premier League for coach Cory Eckstein. Hitting in the No. 2 spot ahead of Cotter, Russell was 2-for-3, including a double and two RBIs in a 7-5 win over Fort Scott, had three hits and drove in a run in a 7-4 win against Hutchison and had three hits, including a double, plus four RBIs in a 10-7 win over Dodge City. Russell hit .357 with 12 doubles, a triple and 41 RBIs in 60 games. He also stole 20 of 22 stolen bases. He played for the Victoria Mariners and coach Mike Chewpoy. Beaudoin batted .326 in 58 games with 15 doubles, four triples, six homers and 46 RBIs. He had two hits and knocked in a run in an 8-1 win against Texas-Brownsville, doubled in a pair of runs in a 9-7 triumph against LSU-Alexandria and doubled in a pair of runs in a 7-6 win against Faulkner. He earned Red River Athletic Conference Baseball All-Conference Second Team honours. DH: Thomas Robulack (Toronto, Ont.) Newman Jets. Robulack beat out his brother Cam Robulack of Delta State by hitting .368 with 11 doubles, three homers and 39 RBIs. He had two hits and knocked in a run 14-9 win over Central Oklahoma, had two hits, including a double in an 8-4 win over Central Oklahoma and was 2-for-2 with three RBIs in a 5-4 victory over St. Edward’s. Robulack played for coach Danny Bleiwas and the Ontario Blue Jays. Left-handers:Dany Coulombe (Saint Leonard Que.) Northeastern Oklahoma A & M Golden Norsemen, Alex Dannett (Brampton, Ont.) 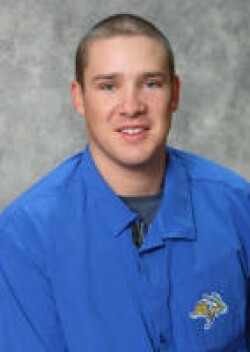 Erie Kats; Jeff Degano (Surrey, BC) Marshalltown Tigers. Voting (first-place votes in brackets): McDonald (28) 163, Slemko (5) 47, Davis (4) 40, Coulombe (2) 39. Dannett (1) 34, Degano (1) 15. Right-handers: John Gale (Toronto, Ont.) West Virginia State Yellow Jackets; Zak Miller (Surrey, BC) Yavapai Roughriders; Cory Hall (Regina, Sask.) Santa Clara Broncos. Voting: Thompson (26) 157, Nixon (4) 90, Gibbs (3 29, Brown (2) 20, Gale (2) 21, Miller (2) 17, Hall (2) 13. Relievers: Shawn Hetherington (Tsawwassen, BC) UBC Thunderbirds, Josh Drews (Eriksdale, Man.) Mayville State Comets; Nick Alexiou (Port Qualicum, BC) Panola Ponies; Drew Parker (Surrey, BC) Brewton-Parker Barons, Russell Kennedy (Surrey, BC) Clarendon Chaparrals, Tyler Vavra (Calgary, Alta.) Southern Idaho Golden Eagles. Voting: Hurley (28) 1, Walkling (7) 55; Sneider (1) 38, Hetherington (0) 36, Drews (2) 25, Alexiou (2) 17, Parker (0) 15, Kennedy (0) 9, Vavra (1) 8. Voting: Edwards (23) 145, Harrison (10) 90, Reeves (4) 40, Untereiner (2) 34, Samyn (0) 30. First base: Chayse Marion (Red Deer, Alta.) 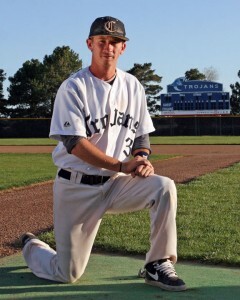 Trinidad State Trojans; Brian Burton (Kitchener, Ont.) Canisius Golden Griffins; Ricky Alvernaz (Victoria, BC) Mayville State Comets; Ben Douglas (Moose Jaw, Sask.) Southern Idaho Golden Eagles; Ryan Saunders (Field, BC) Bellhaven Blazers; Jordan Castaldo (Toronto, Ont.) Arkansas State Red Wolves. 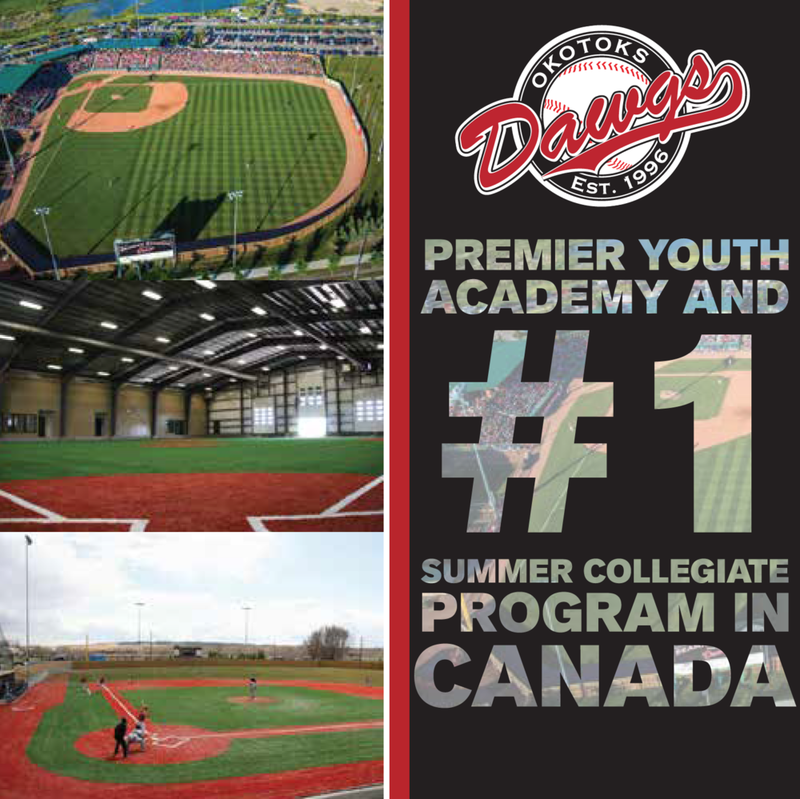 ; Greg Appleton (Port Coquitlam, BC) Cumberland Bulldogs. Voting: Hutton (34) 180, B. Sanders (2) 48, Sneider (3) 27, Marion (0) 23, Burton (1) 22, Douglas (0) 18, R. Saunders (0) 10, Alvernaz (0) 9, Castaldo (0) 9. Appleton (1) 8. Second base: Mike Ferracuti (Etobicoke, Ont.) Erie Kats; Troy Black (Mississauga, Ont.) Maine Black Bears; Tyler Hayes (Calgary, Alta.) Colby Trojans; Keaton Briscoe (North Vancouver, BC) UBC Thunderbirds; Ryland Chin (Strathmore, Alta.) Campbellsville Tigers. Voting: Tissenbaum (27) 165, Slattery (4) 46, Copeland (2) 39, Ferracuti (4) 36, Black (3) 27, Hayes (0) 14, Briscoe (1) 12, Chin (0) 10. Third base: Mathieu Vallieres (Quebec City, Que.) Neumann Knights; Michael Page (L’Épiphanie, Que.) Northeastern Oklahoma A & M Golden Norsemen; Scott Jones (Victoria, BC) Colby Trojans, Alex Calbick (Burnaby, BC) Maine Black Bears; Alex Baldock (Ottawa) Buffalo Bulls. Voting: Lutz (16) 94, Bell (9) 61, Pettit (5) 51, Sawyer (4) 51, Vallieres (2) 41, Page (3) 32, Jones (1) 12, Calbick (1) 11, Baldock (0) 11. Shortstops: Chad Marshall (Paris, Ont.) Stony Brook Seawolves; Josh Federico (Windsor, Ont.) Oakland City Mighty Oaks; Phillip Steer (Toronto, Ont,) Muscataine Cardinals; Stephen Wickens (Whtby, Ont.) Florida Gulf Coast Eagles. Voting: Jamieson (37) 190, Dostaler (1) 54, Cotter (0) 37, Marshall (1) 33, Federico 22, Steer (1) 14, Wickens (1) 10. 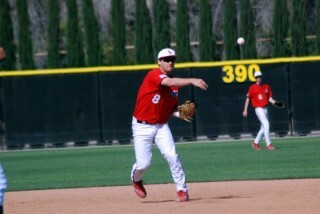 Outfielders: Kyle Turner (Rosser, Man.) Hill Rebels; Tanner Nivins, Kitchener, Ont., Stony Brook Seawolves; Blake Carruthers (Calgary, Alta,) UBC Thunderbirds; A.J. Burlington, Belleville, Ont., Salem International Tigers; Ryan Stajduhar (Kelowna, BC) Clarendon Chaparals; Chandler McLaren (Guelph, Ont.) Douglas Royals; JP Wilner (Regina, Sask.) Valdosta State Blazers; Jackson Gooch (Delta, BC) Lamar Runnin’ Lope; Dany Deschamps (Montreal, Que. ), Northeastern Oklahoma A & M Golden Norsemen; Paul Young (London, Ont.) Grand Valley State Lakers; Tyler Hollick (Calgary, Alta.) Chandler-Gilbert Coyotes; Alex Carnell (Oakville, Ont.) Texas Pan American Broncos; Jordan Gilmour (Gatineau, Que.) Minot State Bison; Mitch Roy (St. Thomas, Ont.) Alderson-Broaddus Battlers, Zach Eibirt (Toronto, Ont.) Muscataine Cardinals. Voting: Larsson (38) 194, Bourgeois (17) 117, Hibbert (10) 78, Calbick (8) 77, Wallace (9) 76, Fleming (6) 71, Mihic (6) 61, Russell (5) 52, Beaudoin (5) 47, Turner (2) 45, Nivins (5) 43; Carruthers (2) 36, Wilner (1) 32, McLaren (2) 26, Burlington (1) 22, Gooch (0) 19, Deschaamps (2) 17, Young (0) 17, Hollick (2) 16, Carnell (0) 6, Gilmour (0) 6, Roy (1) 5, Eibert (0) 5.